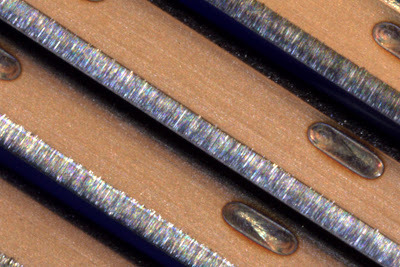 Blades from a Gillette Fusion razor at 5x magnification. At this level of magnification you can clearly see the grinding marks from the placing of the edge on the blades. Canon 40D, 13 seconds at f/16.0, ISO 100, 65mm macro lens, lit with a Litepanels Micro LED light.